How appropriate to post a Christmas card on the 25th - that means it's only five months until Christmas Day! But, actually this is my second Christmas card of the year and the second using these wonderful limited-time Stitched Seasons framelits and Blended Seasons stamp set - you can see the first one here. The white frame I'm using in this card is actually a leftover piece from that previous card. 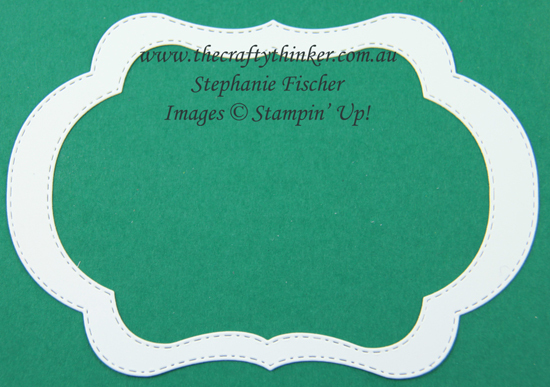 To a Thick Whisper White card base I added layers of Shaded Spruce and Granny Apple Green. I then added the leftover frame and a Real Red label cut with one of the framelits. 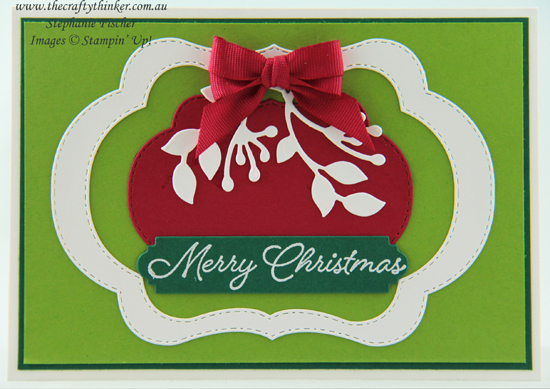 I cut some of the foliage from Whisper White cardstock with one of the dies and added them to the card front then added a bow made from Real Red Cotton ribbon. I white heat embossed the greeting onto a piece of Shaded Spruce cardstock and cut it out with the label die from the Petals & More Thinlit set. I had to extend the die cut a little by using this method. Remember - the Blended Seasons stamp set and Stitched Seasons dies will only be available during the month of August 2018 or while stocks last - so, if you like it, don't delay!